SUBHEAD: I woke up today to the news that the Avenger missile launchers are now out of sight. 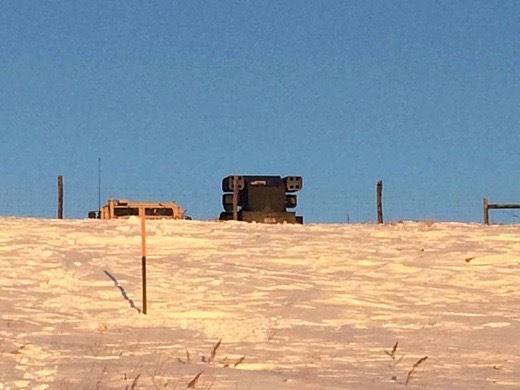 Image above: At Standing Rock the US military has placed an Avenger missile platform (in black) and a supporting Humvee on a ridge aimed at the Sioux encampment. From original article. On Monday morning I was visiting a friend who is on the Standing Stone Camp security force. We were in my truck rolling around looking at things in and around the camp. The night before I had been patrolling near the Turtle Island where the Morton County Sheriff deployed some of his soldiers. Bright lights, concertina wire was all in check. Nothing moved or changed. The scene had remained the same for weeks. drive truck and its traction. I plan on establishing a thruway on the river ice when I get back from D.C. Friday night. The weather out there was warming up; on the night in question, Sunday, it was a balmy 25 degrees. But, the ice remains at about 2 to 3 feet on top, more than enough to support vehicles. On Monday, my friend and I finished our drive and ended up at the Backwater Bridge. By then half the blockade had been removed by North Dakota law enforcement. We were talking as we were testing my new pair of Air Force military binoculars with enhanced night vision and range finder. Boo yeah. They work great. We could see the hinges on the outhouse the cops have on the hill due south-by-southeast. We were talking and I spotted something different, something very different: An additional obstacle did I see. Darker than the desert dust-colored Humvees that have so far been commonplace. I zeroed in on the new site and to my surprise, to my befuddlement, as clear as day there sat parked a modified Humvee. Modified how? Well, the Humvee was a platform for a Mobile Avenger Missile Launcher. We’re talking some pretty savvy laser-aimed, heat-seeking bad-to-the-bone weaponry, complete with night vision sensors and range finder and 50-caliber gun. “What on god’s green earth is this exactly?” I exclaimed, in a voice near like to a scream. “My suspicion is that the Avenger Missile Systems deployed to Standing Rock are a cost-effective alternative to having an Apache Helo flying overhead when they need it. The Avenger system has Forward Looking Infrared (FLIR) Capabilities. The civilian plane and helicopter probably don’t have FLIR and that is when they need an Apache Helo to “monitor” situations under darkness and record for evaluation later. Instead of calling up the Apache, they can have Avengers on-site for instant intelligence day or night. The Avenger system also has video capabilities. It costs them far less to have an Avenger system on the ground 24 hrs a day than to deploy an Apache Helo occasionally. The security ground forces have Night Vision but the Avenger has FLIR and a laser rangefinder along with video capabilities. Remember Barney Fife in the Andy Griffith show of the early 60s? Andy would allow Barney only one bullet for his revolver. Well, someone on some government level (Homeland Security is my guess) gave these badged yokels not one but two Avengers, each housing 8 rounds of missiles. It would be only a matter of time before one of the Barney’s over there would come to work still buzzed from the Super Bowl festivities and while leaning over, to puke, say, accidentally put his hand up to balance himself on the FIRE button. Or, worse, intentionally and meanly FIRE the thing. By the way, the missile launchers were aimed at the Camp. Wednesday afternoon, my colleagues and I had the chance to accept an invite by Secretary of Interior Sally Jewell to conduct an exit interview with her on all things Indian country. During the interview I took the chance to show her the pictures I had on my phone. The expression on her face was one of horror. She maintained her composure quickly and simply said, “This looks like something out of Star Wars.” She was referring not just to the strange sight of the Avenger, but its grey brown surroundings. Frankly, it looks like death follows this launcher where-ever it goes. And, indeed it does. Apparently, according to this statement, my buddy’s initial reaction was correct. The Guard insists the launcher’s role was “passive”—merely a warm place to observe the camp with high-tech vision equipment that they had quietly used for over a month in lieu of employee expensive Apache helicopters. It appears the military has abandoned its number one rule: Don’t carry an empty gun to a fight. Doesn’t that make us all feel better? SUBHEAD: They are bringing in law enforcement in full riot gear with batons and plastic masks from all over the country. Trump's order will certainly lead to further resistance in the weeks and months to come. As we anticipate further protest and look back on the monumental resistance of the past few months, it's important to recognize and acknowledge the draconian legal measures that have been taken by local, state, and even federal authorities at Standing Rock. Even while most media attention has stayed away from the Water Protectors' camps, arrests have continued. On Martin Luther King Jr. Day, January 16, three peaceful prayer walkers were arrested and charged with Trespass, Inciting Riot (felony), Preventing Arrest, Engaging in Riot (misdemeanor), and Criminal Mischief. The Morton County Sheriff's Department posted a video of these arrests. January 18 saw 21 more arrests, most of which took place on the Backwater Bridge near the camp, during another peaceful demonstration. Charges included carrying a concealed weapon, criminal trespass, physical obstruction of a government function, and preventing arrest. In the wake of these arrests, the Morton County Sheriff's Department released a statement saying that "field commanders authorized use of less-than-lethal munitions of direct impact sponge rounds, drag stabilizer bean bag rounds, hand deployed pepper spray canisters and smoke riot control CS canisters." Sarah Hogarth, the Communications Coordinator for the Water Protector Legal Collective told Truthout of these arrests, "One of our local attorneys reported that the judges are considering holding people/increasing bond if they do not have a local North Dakota address and phone number." Meanwhile, other harsh measures from law enforcement authorities include the deployment of an "Avenger missile launcher system" at camp, purportedly to observe Water Protectors, and on January 20 Morton County released a video attempting to explain why the police are wearing tactical gear. Additionally, North Dakota Republican lawmakers recently introduced a bill that would protect drivers who "accidentally" hit and kill protesters. The DAPL pipeline, a project of Energy Transfer Partners (ETP), is slated to transport more than half a million barrels of fracked oil every day, and if ETP gets its way, will pass underneath the Missouri River a mere half mile upstream from the Standing Rock Sioux Tribe's drinking water source. That means the pipeline would affect millions of people and at least 28 tribes. Navajo attorney Stephanie Tsosie, who works for Earthjustice and represents the tribe at Standing Rock, has also expressed concerns about the desecration of tribal burial and sacred sites. In September, Tsosie told Democracy Now!, "It is important to remember that this land is an area that these tribes have inhabited for time immemorial, and there are sacred sites around the entire area." A Water Protector who was shot in the leg, face, and back of the leg by beanbags and harassed by law enforcement, a Navajo man named Marcus Mitchell, recently shared his testimony, saying, "One officer was leaning on my head … they yelled at me to stop resisting as I lay there motionless." Mitchell was arrested and taken away in a police vehicle while a police officer pinned one of his arms behind him, making it difficult for him to breathe. Amnesty International, which sent a team to Standing Rock to investigate human rights abuses, even stated that some of the treatment of those arrested violates the prohibition on cruel, inhuman or degrading treatment -- and that is not the only violation of international law that has occurred at Standing Rock. The World Health Organization (WHO) stated in its 2010 Fact Sheet on The Right To Water, "Access to safe drinking water by indigenous peoples is closely linked to their control over their ancestral lands, territories and resources. Lack of legal recognition or protection of these ancestral lands, territories or resources can, therefore, have far-reaching implications for their enjoyment of the right to water." Meanwhile, according to the Water Protector Legal Collective, Acting Morton County States Attorney Ladd Erickson has threated Water Protectors "with bills for their court appointed attorneys and his scandalous misrepresentations of those on trial is designed to create local bias and poison the jury pool … before trial." Ladd's efforts would mean that defendants would, whether innocent or guilty, be responsible for repaying the state for money paid to their court appointed lawyers, an action that "would only apply to Defendants charged with opposing the Dakota Access Pipeline." "The rhetoric used by Prosecutor Erickson castigates the defendants and their attorneys for availing themselves of their most fundamental first amendment rights to speech, assembly, and meaningful protest, and to their sixth amendment right to a defense attorney in a criminal trial," the Water Protector Legal Collective wrote of Erickson's actions. "Moreover his unfounded accusations done maliciously and intentionally seek to and may have prevented them from getting an unbiased jury and a fair trial." The Water Protector Legal Collective has even called for Mr. Erickson to step down as prosecutor, noting, "He is clearly acting more out of personal animosity than fairly representing the People of the State of North Dakota in this matter." For nearly half a century, Jeffreyaas has been working as a criminal defense and civil rights attorney representing progressive movements and victims of police abuse. He was a founding partner of the People's Law Office in Chicago (1969-2003), was co-counsel in Hampton vs. Hanrahan, which exposed the police and FBI murder of Black Panther leader Fred Hampton, and ran a successful campaign to expose Chicago Police Commander Jon Burge's legacy of torture. He is the author of The Assassination of Fred Hampton: How the FBI and the Chicago Police Murdered a Black Panther. Truthout: From a legal perspective, what are some of the more extraordinary things you're seeing at Standing Rock? There were several particular incidents that occurred on September 3rd. DAPL was bulldozing sites that the day before had been identified as historic sacred and grave sites of the Lakota Sioux. Immediately following the archeologists' identification of these sites and their location in a court case, the very next day DAPL came out and bulldozed those sites. That was the day they [DAPL] had their own security guards there with dogs. People were surprised this was going on, but it was just a few hundred yards from a peaceful demonstration … so the people went to the bulldozers to protest and they were attacked with dogs. This was some of the footage on Democracy Now! Eleven people were bitten by dogs of the security guards. I witnessed this firsthand and interviewed some of the victims on site, who then had to be treated for open wounds on their arms, chest, and legs. That was September 3. There were probably 300 people there who stopped the bulldozers. The only people charged that day were Amy Goodman, a journalist, and Cody Hall, an organizer of peaceful demonstrations and who had been recognized by law enforcement. They were not arrested that day … they instead were charged with trespassing and the prosecutor asked that their charges be raised to riot, and the judge refused, so their cases were dismissed when they went to court. When Cody Hall got to the jail there were FBI personnel there seeking to interview him, probably in order to intimidate him since he was a spokesman. The prosecutor has often accused the Water Protectors as appealing to social media and trying to get arrested and ignoring their claims of protecting their water and working to stop the "black snake" that is carrying the oil. More than 200 nations have joined the Sioux nation, and there has been [the largest] coming together of Native nations … in at least 150 years, and they've set up three camps at Standing Rock. It is a place where people are welcome, with a kitchen, clinic, a school, and cultural sensitivity training. There was an amazing spirit in the camp that swelled to as many as 10,000 over December 4 when more than 2,000 veterans joined the camp to oppose the attempt to shut it down. Law enforcement response has escalated from a smaller presence to far larger. The dogs were those of the private security guards, and there's been a militarization of the law enforcement response. This means they are bringing in law enforcement in full riot gear with batons and plastic masks from all over the country. More recently in their sweeps they've used sound cannons, rubber bullets, and tear gas. On November 20, when it was freezing cold and people were on the bridge, they used water cannons. They are shooting projectiles that explode, that have injured a number of people. These explosive projectiles are thrown or shot into concentrated groups, along with a massive amount of tear gas. Most recently, they've cordoned off the road between the camp and where the pipeline crosses the highway. They won't even let people get to where they were protesting before, because the pipeline has proceeded right up to Lake Oahe, next to the river. DAPL now has an outpost near the river that looks something like a military Forward Operating Base in Iraq, with concertina wire, guards, spotlights, and armed guards. A judge has said he won't open back up the protest area until the protestors leave and promise not to protest anymore. There has been a repression of free speech, and the sheriff, Kirscheimer, and the prosecutor, Erickson, have claimed the Water Protectors were violent, which is untrue, as it’s the law enforcement that have been violent. The prosecution has attempted to vilify Protectors, saying they are dupes of radical lawyers, that they shouldn't be allowed free attorneys, and that they should have to pay the state back for the law enforcement costs for arresting them, which could easily be $1,000 a case for a misdemeanor. With all these cases, the local bar association has been overwhelmed. Neither the local courts nor lawyers are prepared to handle this number of cases. We've asked the North Dakota Supreme Court to allow extra lawyers to come in and act without a local lawyer present, but they've thus far not allowed this. In many cases people have applied for lawyers and been turned down because they didn't fill the forms out the right way. On October 22, hundreds of people were walking across a field to find out where the construction was going on. They were met by a phalanx of law enforcement in full riot gear, there was no warning, and they were told they were under arrest for trespassing and if they fled they'd be charged with fleeing. Trespass requires a sign or notice to be given, and none of that was done. On November 20th, a DAPL worker was approaching protesters in a vehicle from the rear in a truck, driving fast and carrying a gun. Some of the security people with the Water Protectors stopped him, took his gun, and none of them were armed, and turned him over to the Indian police. Later on the three people who helped disarm him and turned him over to the local authorities were charged. One of them was charged with terrorizing this person, [but] this person [who was] charged was unarmed and got the guy to put his gun down. So this case shows collusion between law enforcement and the pipeline, as they were sharing information, and law enforcement was clearly doing the bidding of DAPL. If DAPL needed the pathway cleared, then law enforcement would show up and do that. Law enforcement was much less concerned with the constitutional rights of the citizens and more concerned with DAPL getting their pipeline constructed. We are discovering there is a grand jury going on. One of the Water Protectors was hit by a projectile in the arm and shoulder and has lost functioning of her arm. It looked like it was going to be amputated, but so far it remains attached, but still has 10 more operations to keep it functioning. She was airlifted to a hospital in Minneapolis, but they have a grand jury going to show it was the Protectors or she herself who blew herself up that caused the injury, despite eyewitnesses having reported seeing her hit by both rubber bullets and an exploding projectile. Department of Homeland Security went to the hospital where she was and took her clothing and got the fragments removed by surgery from her shoulder, and they are trying to build a case and say the fragments match petrol or some kind of igniting canisters that they say came from the Protectors. We are finding criminal investigation departments of various state police departments that are following up with people who have been arrested, questioning them about why they went to Standing Rock, and asking them about other cases of people who went there. This happened in Indiana, when a plain-clothes cop with the Indiana State Criminal Police Intelligence showed up at an activist's house to question them. The tactics of the dogs reminded me of Birmingham, Alabama, where the dogs used there were let loose on civil rights marchers. As do the water cannons that were used in Alabama against the kids. We've not seen these tactics used in a long time. At the same time it's a much more sophisticated surveillance methodology. In camp anytime you look up there are drones, planes, helicopters, and chemicals being sprayed on people at night that left folks with chronic respiratory symptoms. Very strange thing, and we don't know what those chemicals might have been. In response, some of the people in camp had drones, which is legal as long as they are registered, in order to watch law enforcement and the pipeline. But in one case a guy's drone was following the police, and they knocked down his drone and charged him with stalking, and that is now a pending case. And now there is a lawsuit that many local landowners are suing DAPL for defrauding them to sell easement rights for too cheap, or under false information. A number of families were intimidated [in]to selling their easements under eminent domain, or offering bonuses that were never delivered, etc. … That's what the suit alleges, and that was filed in federal court. The attitude of the courts up there is really something else. For example, the pipeline filed a "slap suit" to stop the protesting, and the judge granted them a TRO without the other side given an opportunity to respond. The disdain some of the courts have shown the Water Protectors has been clear. They see them as outsiders, and [are] not giving them credit for protecting their water and sacred sites, and are not recognizing the legitimate claims of the tribes. Under the Treaty of Laramie in 1871, the land the water protectors are on was given to the Sioux. So the US never took it back from them, so even though it's not technically reservation land, it belongs to the Sioux, and that's where this is all happening. One of the most egregious and racist things about this is the pipeline was proposed to go through Bismark, but since there was so much objection as it threatened their water, as Bismark is 98 percent white, they moved it to just upstream of the Standing Rock Reservation. So the pipeline is only there because the white people didn't want it on their land. Trump has been an investor in the pipeline. He says he's decreased his investment, which I question. He's made the construction of pipelines and general fossil fuel development a large part of his program. I think he'll make Standing Rock a target. Instead of the Army Corps of Engineers having a new EIS [Environmental Impact Statement] done, as it is calling for, he'll erase that, and tell the pipeline if they drill under the lake they won't be prosecuted anyway.